The BLIS curriculum shall include knowledge, skills attitudes, values and experience that will provide prospective information professionals with the necessary competencies essential for effective provision and delivery of library and information services, the systematic organization, conservation, preservation and restoration of books, historical and cultural documents and other intellectual properties. The future library professional has many challenges and school of library and Information Science need to build wide range of information –related career to library science graduates, To build better collaboration with libraries for building our knowledge base, the information age, library information professionals hence better opportunities to move ahead than ever before. 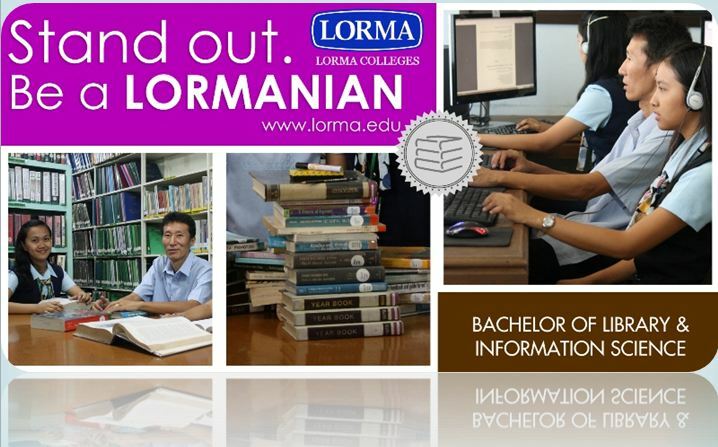 The potential employment of its graduates outside the country is very promising, a number of Filipino librarian are working North America, England, Australia, Singapore, Hongkong & other countries where English is used in Information Management. An overview of libraries and librarianship; historical development of libraries; types of libraries; library profession including Code of Ethics for Filipino librarians, and RA 9246 and laws and issuances related to Philippine Librarianship. Introduction to librarianship provides the theoretical and philosophical underpinnings of the profession with emphasis on its practice in the Philippines. The course focuses on the historical perspective and the philosophical of librarianship. Principles and methods of selecting and evaluating different kinds of information sources; the librarians’ role as material selector; development and maintenance of collections; bibliographic tools and on-line data bases; publishers and publishing; acquisition process. Development of calatloging and classification systems; descriptive cataloging; classification and subject analysis of books and other monographs using Ango-American Cataloging Rules; DDC Scheme, principles and techniques of catalog construction; authority and withdrawal files. Library of Congress Classification Scheme; cataloging of continuing resources and non-print materials; use of computerized cataloging systems and other trends in cataloging. Introduction to reference methods, literature searching and bibliographic techniques; evaluation and use of principal types of information resources. It covers the basic reference sources and materials for different library users. Principles of organization and management for effective library and Information services. Principles, theories and development of abstracting and indexing, designing of thesauri, preparation of book and journal indexes and abstracts. Computer application to libraries; principles and technologies used in libraries and information centers to store and retrieve information in print and other formats. it offers a basic knowledge of information handling and processing. Evaluation and use of reference sources, both print and nonprint, in special sunject fields; further study of the use of new technologies in information searching and retrieval. Introduction to the various components of information technology (IT) as applied in libraries and information centers and in accessing information in general. Emphasis will be placed on the hardware, software and communication componente of IT and its impact on the curtrent practice of the profession. Study of the various methods and techniques of conducting research; and discussion of its application in library and information science. Selection and evaluation, organization and use of documents, continuing resources, non-book materials and electronic resources. Selction and evalaution of library materials suitable for the reading abilities, interests and needs of children. Objectives, organization and management of the school library media center for maximum support to educational program of the school. Objectives, organization and management, and services of academic libraries. Objectives, organization and management, and services of special libraries. Objectives, organization and management, and services of public libraries. Nature, functions, types of archives; principles and methods in the management of archives. Field work or practicum in different types of libraries: school, academic, special and public. The coverage of the course is structured to cover the key dimensions of the development of children and adolescents: physical, linguistic, cognitive, and socio-emotional development. For each dimension, the core contemporary research findings and theories are covered. Particular emphasis is given to the factors that have been identified as having positive or negative effects on the natural course of these developmental processes. In addition, some focus is given on the exceptional cases when children or adolescents vary from the natural course. The course coverage shall focus on contemporary theories and research on learning. The exploration and discussion of these theories and research will focus on how these apply to the Philippine, regional, local, and personal experiences. More importantly, the processing of the theories and research will emphasize how teacher may use the various ideas to better facilitate the learning processes among students. This course introduces the prospective teachers to the three foundations of education, namely, psychological, anthropological and sociological. In the discussion of psychological foundations, the learner, the learning process and the learning situation are emphasized. It discusses the significant facts about each of these components and their inter-relationships in determining the effectiveness of any teaching-learning endeavor. On the anthropological foundations, emphasis is given to culture, cultural heritage, the Filipino family, and Philippine culture values. Sociological foundations include topics like education and society and socialization. This course will also help the prospective teachers equip themselves with the skills and techniques in understanding the scientific principles of human growth behavior. This course aims at developing habits of thinking, listening, reading and writing skills. Emphasis is laid on mastering of basic grammatical structure in English. This course aims to reinforce and broaden the students’ listening, speaking, reading and writing skills. It deals with the forms of oral communication, building word power, sentences construction, and paragraph composition writing and preparing a term paper. This course provides for the improvement of skills needed in oral interchange between people. It includes a study of the mechanics of oral communication and public speaking, the principles underlying the performance of each form and great deal of opportunity for intensive practice. This course explores how students comprehend and learn with text and how teachers assist them in these processes. Participants will explore the nature and meaning of comprehension and strategic teaching and learning and will examine what it means to learn with texts. The emphasis in the class will be on the development of ways to think about the use of comprehension and content reading strategies within the context of effective instruction. Further, this class is built on the understanding that children should be given material on their instructional reading level in order for comprehension to take place. Theoretical and foundational considerations will help frame the exploration, modeling, and practice of a range of strategies. Ang Filipino 1 ay isang metalinggwistik na pag-aaral sa gamit ng akademikong Filipino sa iba’t ibang sitwasyon at larangan. Sa parrang interdisiplinaryo at interaktibo, inaasahang mauunawaan at malilinang sa mga studyante ang mga kailangang kaalaman at kasanayan sa paggamit ng Filipino sa lalong mataas na edukasyon. Nagbibigay ng focus ang kursong ito sa pagbasa at pagsulat bilang instrumento sa pagkatuto. Pag-aaralan dito ang mga estratehiya sa kritikal na pagbasa ng iba’t ibang genre ng mga tekstong nakasulat. Idedebelop din ang mga kasanayan sa pag unawa lalo na ang kasanayan sa pagsulat ng iba’t ibang akademiko. Magiging batayan ng paksa ang ukol sa Humanidades, Agham Panlipunan at Agham Teknolohiya. Ang Filipino ay pag-aaral ng mga prinsipyo at proseso ng masining na pagpapahayag sa Filipino. Nakatuon ito sa malayang pagtuklas at pagpapakita ng sariling kakayahan at talino sa pasulat at pasalitang pagpapahayag at pagbabahagi ng mga ito sa komunidad, bansa at daigdig. Panimulang kurso ito sa panitikan ng Pilipinas na ginagamitan ng makasaysayang pananaw. Sumasaklaw ito sa pag-aaral ng kaligirang pangkasanayan sa panitikan sa paglalakbay sa simula at paglinang ng panitikang Pilipinong kinikilala at mapatanyag sa iba’t ibang panahon ng ating kasaysayang kasama ang mga manunulat nito, sa pagsusuri at pag-aaral n gating mga anyo ng panitikan at mga uri nito, sa pagpapahalaga sa mga dakilang bayaniat mga tanyag na manunulat sa larangan ng panitikan upang makamit ang pinakamimithi ng bayan. This course highlights the visual arts, music and dance, literature drama and the film as special friend of the humanities. It also present to the students the importance of the human being, his thoughts, and feelings, and how he express those feelings and emotions through the manifestation of the arts. It also makes the students aware of the importance of arts and its vital role to ones life. Hence, this course aims to enable students and teachers to plan creative activities and to projects individual lifestyle. This course is designed to introduce students to the basic concepts of logic, and the applications used. It discusses the nature, functions and applications of reasoning, the uses of daily language. This course is designed to introduce the students to the basic concepts of logic and the applications used. It discusses the nature, functions and application of reasoning, the uses of daily language definition and format, providing theories and techniques. It includes also a section of fallacies, which all expose errors in reasoning even in everyday communications, and which will provide ways and means to minimize these tendencies of violating the rules of logical reasoning. This course deals on signed numbers, definitions, theorems and methods of elementary algebra. It aims primarily to strengthen and maintain previously learned skill foundation laid in the high school years and enabling the students to be better prepared for more high standard kind of algebra. This course deals with the indirect measurement of angles, line segments and sides of a triangle. It gives the emphasis on the study of the trigonometric functions of an acute angle, solutions of a right triangle and obligue triangle, common logarithmic trigonometric formulas and identities. This subject deals with the importance and uses of statistics in our lives, concepts, or items used in statistics, measures of central tendency, measures of variability, testing hypothesis, correlations and any other statistical tools needed to treat a certain research problems with its applications. A course for general education that deals with the various aspects of biological science. The course provides background knowledge for the study of the cell, invertebrates, vertebrates, plants, human anatomy, and environment. This course provides basic biological knowledge, including an understanding of: 1) the scientific method, 2) basic genetics, 3) the diversity of life on earth, 4) plant and animal structure and function, and 4) ecological issues. The course provides an integrated coverage of the basic concepts and principles of Ecology and the major human implications of these concepts. This involves a holistic approach in dealing with man’s relationship in his environment. Included are topics on the nature of ecosystems, relations of individuals and populations, the major communities and man’s impact on environment. It is a course which deals with the study of the basic principles in chemistry, its test and measurements, the atomic structure of chemicals, the oxidation- reduction, reactions of substances, different gas laws, solutions- its preparations and methods of expressing their concentrations are also included which could help the students prepare and assimilate the basic inorganic chemistry. Applications though experiment that are most suitable for medical students are included. This is an introductory course on information and communication Technologies topics include ICT terminologies, hardware, and software components, the internet and Word Wide Web and ICT based applications. This course deals with the study of human behavior. It is particularly focused on what, why and how of human behavior. Drug education and prevention has been incorporated in the subject matter. Practical applications of the concepts and theories to everyday lives of students are provided through the different learning experiences conducted with the students. This course deals with the Philippine Value System and motivations that help explain people’s characteristics, traits and behavior. It includes the family, its role, forms structure and Family Planning methods to help students understand how Sociology shapes the society of the future. This course deals with the systematic and comprehensive study of the government, state and the constitution of the Philippines. Primarily it is concerned with how the government operates and its functions to the growth and development of not only the government but also the society in general. A systematic comprehensive careful study of the course makes one aware of the definition and limitation of the power vested in the government and the rights of the people with in the state. Furthermore, it enhances nationalistic feeling and cooperation of the people. Knowing the different principles that govern each public affairs and relations help the students realize and feel that they need to take stand in the development of Philippine Society. It encompasses the basic principles and concepts of economics, which is relevant in the decisions concerning the production, distribution and evaluation of health and health care. It also includes the basics of taxation focusing mainly on taxation on individual taxpayer. And lastly, the underlying factors for the implementation of and reform, agrarian reform and comprehensive agrarian reform. A study of the earth surface and its physical and natural attributes, and its relation to society and development. This course deals with the history and government of the Philippines that serves as the guiding charter of the present Philippine government as well as the concerned individuals embodied in it. It reveals not only the kind of leadership, the political experience, the socio-moral values and the cultural heritage that we have, but also the aspirations and details of our country. The details on the history of our country can be shown ancient to present. This course deals with the life, works, and writings of Dr. Jose Protacio Mercado Rizal. It aims to present to the students the different attribute that made him acclaimed, “Great Malayan”. It presents the richness of Rizal’s thought and teaching which his living legacies to the human race are. The course further aims to let the students see themselves in Rizal’s life they may realize the essence of their being a Filipino and that their national consciousness be awakened and help the Philippine attain greater heights. It is within the aim of this course that these young citizens develop in them a perspective and horizons patterned with that of Rizal is worth emulating. This course includes instruction and practice of alignment positions, facing, posture and gymnastic free hand and other physical fitness exercise and skills. It includes steps, movements and music related to dance particularly social dances, foreign dances and also the Philippine Folk dances. These social dances when learned by the students foster camaraderie and sociability among the different members of the society. Learning the foreign folk dances also teach the culture of their foreign brothers. On the other hand, students learning the Philippine folk dances develop patriotism and it also preserves the culture of the early Filipinos. These dances aim to keep individuals suppleness and develop coordination, flexibility and to keep the body graceful. Practice in fundamental skills and study rules in Badminton, Table Tennis and other individual and dual sports. This course deals on team sports and events competed or contested among groups or teams. This course introduces a brief study of the Old Testament books, the power of the Bible writing as applied in one’s life, the social behavior of man or influences of a group or individual, which affects his personality, leadership, group participation, attitudes and prejudices. It is an analysis of religion as an important institution of society with the emphasis of the life, person and ministry of the Lord Jesus Christ. This course is a general approach of the study of social religious process in the dynamics of the social system with emphasis of the basic guidelines in social and religious living in a social organization based on scriptural principles. It also introduces the basic knowledge of love, selection and marriage preparation components of marital adjustments, parenting and marital problems. The Civic Welfare Training Service (CWTS) is one of the three components of the National Service Training Program (NSTP). NSTP is a program aimed s\at enhancing civic consciousness and defense preparedness in the youth. It is attained by developing the ethics of service and patriotism specifically designed to enhance the youth’s active contribution to the general welfare. CWTS 1 is designed to train, encourage and help students to plan, implement, and evaluate community projects and activities. This will contribute to the general welfare and betterment of the life of community members that will lead to community development. It is intended for improving health, education, safety, livelihood, environment, entrepreneurship, arts, recreation, morals of the citizenry and other social welfare services. The Civic Welfare Training Service (CWTS) is one of the three components of the National Service Training Program (NSTP). NSTP is a program aimed s\at enhancing civic consciousness and defense preparedness in the youth. It is attained by developing the ethics of service and patriotism specifically designed to enhance the youth’s active contribution to the general welfare. CWTS 2 is a continuation of CWTS 1 designed to train, encourage and help students to plan, implement, and evaluate community projects and activities. This will contribute to the general welfare and betterment of the life of community members that will lead to community development. It is intended for improving health, education, safety, livelihood, environment, entrepreneurship, arts, recreation, morals of the citizenry and other social welfare services. The Bachelor of Secondary Education meets the purpose of making the teacher education responsive to the demands of a rapidly changing society and the challenges of global competitiveness. 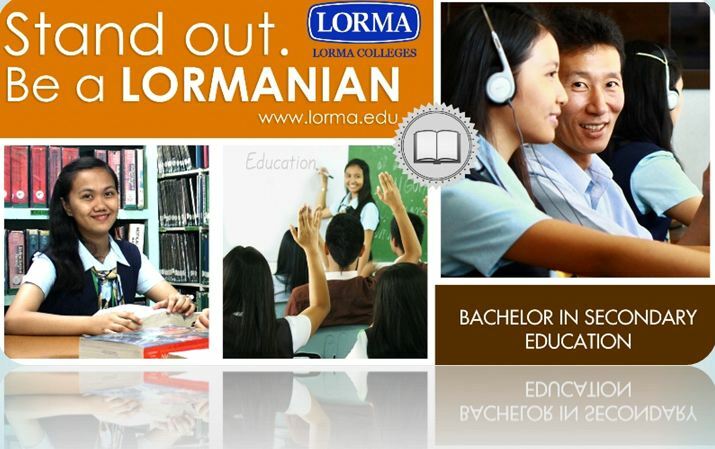 Lorma provides our student teachers a dynamic avenue to acquire excellent communication skills and pedagogical understanding of the teaching profession. The college equips our students with these proficiencies to help them develop a professional identity and strengthen the fundamental competences initially acquired. Our majors cater to the growing demand for competent Science, Math, and Computer teachers in the country. This teacher education curriculum will include a body of knowledge, skills, attitudes, values and experience that will provide prospective teachers with the necessary competencies essential to effective teaching. In effect, this course will prepare the future teachers in assuming multidisciplinary roles in a dynamic society. The College of Arts and Sciences provides an intensive training through in-school seminars, symposiums, conferences and affiliation with the Philippine Association for Teacher Education (PAFTE) for regional and national seminars. Apart from these, students are given the chance to successfully perform their best in their internship and thus be given incentives and award as the Most Outstanding Student Teacher during the in- and off-campus internship. • Respond to the varying types of learners in varied learning environments. • Develop interests and skills in the preparation of innovative and progressive instructional materials. • Develop higher order thinking skills among teachers and learners. • Prepare the teachers for life long learning and teaching.